Breaking News: Ky Downs Announces Plans to Expand At Same Time It May Be For Sell? It has been an interesting afternoon concerning news — and, ironically enough, no news, as well — coming out of Franklin, KY. regarding Kentucky Downs. At 3:32 p.m. ET this afternoon, “The Pressbox” reached out to Kentucky Downs’ track officials — again — asking for comment about a possible sale of the racetrack and all of its amenities which are located in Franklin, KY.
For several weeks now, “The Pressbox” has been working on a story that Kentucky Downs – the sprawling, European-styled Thoroughbred racetrack, which also owns and operates an extremely successful Historical Racing betting parlor on its’ location near the Tennessee border — was in the process of considering serious offers for a possible sale. During Kentucky Downs’ most recent live race meet in September, multiple sources confirmed to us that representatives from at least two different groups had been touring the location and reviewing the facility in contemplation of a possible offer and sale. Acting on that information, “The Pressbox” reached out repeatedly to Ray Reid, one of the partners in the Kentucky Downs partnership, and, according to our information the managing partner, via text, email and multiple phone calls. While we have received no response to our requests, just 29 minutes after our latest inquiry this afternoon to Kentucky Downs’ President Corey Johnsen, the track released a press announcement with details about its’ application to own and operate a new facility in Oak Grove, Ky., and news that it is willing to spend an additional $25 million on updating the facility it currently owns. For the record, the “The Pressbox” was the first news outlet to report that both Kentucky Downs and Caesars’ International, which owns a standardbred operation in Paducah, KY. known as Bluegrass Downs, were submitting applications for a racetrack license in Oak Grove — becoming the second and third such applications — before the deadline of Oct. 1. Previously, and about a year ago, a new consortium and business entity created by Keeneland and Churchill Downs submitted a detailed, expansive, and aggressive proposal to build a racetrack in that Southwest Kentucky community. Just a few weeks ago, we also announced the news that the new collaboration had submitted a “dates request” to run live Standardbred dates at the old Louisville Downs facility in 2019, with the idea of moving those same dates their Oak Grove facility if the Kentucky Racing Commission issued that license to the Keeneland-Churchill Downs venture and once the new facility was fully constructed and operational in 2020. According to multiple sources, we have learned that an independent banking institution, based out of Dallas, TX., was contacted and contracted before the September race meeting, and that firm did begin the early process of identifying possible buyers for the Kentucky Downs racetrack, and all of its amenities. Our sources told us that the consulting firm performed some significant due diligence, and has a financial report that it has been sharing with some serious, potential, and interested parties. 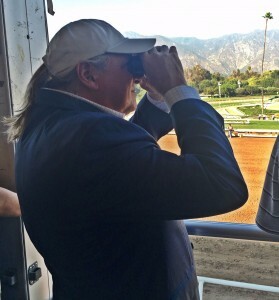 To date, we have been informed by several key sources that representatives from at least two separate and different racetrack operators — one being Delaware North — have already been on location to review the track and all of his associated operations. In addition, we have been told that those officials have walked the grounds; reviewed the track; examined the Historical Racing casino area; and observed the full operations. Although an official offer has not yet been accepted — and we were told that the current racetrack management team would not officially consider a possible sell and transfer of assets until after the 5-day race meet was concluded on Sept. 13 – we have confirmed from multiple sources that at least one of the tracks is planning to make an official offer for consideration. In addition, we are told that other major racetrack operations located throughout the country have also attempted to make contact with the banking representative to find out the details of the possible sale, and potentially enter into the negotiating process. Some of those tracks that are potentially interested in learning the details for a possible sale, are being told that they would have to be “approved for consideration,” before they could enter the negotiations. According to our information, the “asking price” for the track, all of its’ properties, and associated operations is in the neighborhood of $150,000,000. We are told, though, that the bank orchestrating the interview process may attempt to raise $175,000,000 for the sale, which would include an additional $25,000,000 to be spent on improving the current property and facility. There are two current issues complicating the possible sale, at this time. One is the pending litigation regarding Historical Racing that is currently being decided in Franklin Circuit Court. A final decision by Judge Thomas Wingate has been expected in that case for quite some time. But a final rendering has not been issued, to date. The second issue is the possible issuance a new racetrack license in Oak Grove. According to some of our sources, one of the possible buyers wanted Kentucky Downs to apply for the license in order to preserve a possible “right” to also build, own and operate in that location, as well. Again, Kentucky Downs’ officials have not responded to multiple requests for comment — to either confirm or deny the information. That $45 million proposal is well below the projected sum that the Keeneland-Churchill Downs team announced in its’ application for a racetrack in that area. In its’ official proposal to the Kentucky Racing Commission, the Keeneland-Churchill proposal called for an expenditure north of $125,000,000 — nearly three times the investment. “The proposed track would race 15 days from Oct. 11 to Nov. 10, 2019, with purses fueled year-round by up to 500 Exacta Systems historical horse racing (HHR) terminals, the innovative technology that marries the pari-mutuel wagering system that is the backbone of American horse racing and the action of electronic video gaming while based on the results of previously-run races. The harness track will be five-eighths of a mile with 450 stalls. “The global design and architectural firm Populous— known for the renovation and expansion of world-class facilities such as Ascot Racecourse and Yankee Stadium — has been retained for both Oak Grove Meadows and the Kentucky Downs’ expansion. Dennis Moore, one of the country’s most-respected track superintendents, will oversee the construction of the new harness racing surface. The Kentucky Racing Commission is scheduled to meet throughout the month of October to consider all three proposals for Oak Grove which have been submitted. The third proposal is from Caesar’s Entertainment, but, to date, that entity has not released any details about its’ plans. The Commission is scheduled to announce dates for live racing in 2019 the early part of November, in a regularly-scheduled meeting of the entire Commission. A final decision on which application has been accepted could be announced at that time.